According to fossil evidence, the wild rose has been around for around 35 million years. For the past 5,000 years, rose varietals have been bred by people. The first humans to purposely cultivate roses were the Chinese, who grew them primarily for medicinal purposes. 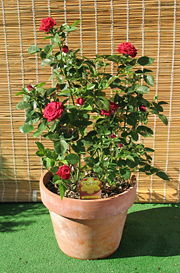 During the Roman period, roses were grown throughout the Middle East. They were used as confetti at celebrations and as a source of perfume. Roman nobility ordered the installation of large public rose gardens in the south of the city. After the fall of the Roman Empire, the popularity of roses rose and fell in cycles. At some points in Western history, cultivated roses could only be found in the gardens of monasteries in Europe, which were responsible for perpetuating earlier strains. In the late eighteenth century cultivated roses were introduced into Europe from China. Most modern-day roses can be traced back to this time. These new cultivars were repeat bloomers, setting the stage for breeding work with native roses to select for hardiness and a long bloom season. 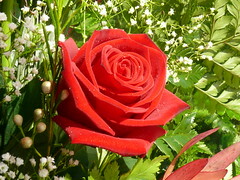 At that time there was little color selection among European roses, and they didn’t bloom more than once a year. Roses imported from Asia were of greater quality, variety and many offered repeated blooming. The joy of tending plants that bloom throughout the growing season caused rose gardening to catch on as a hobby throughout the developing world. 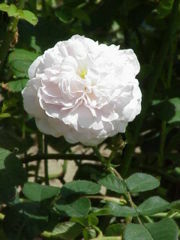 Empress Josephine, wife of Napoleon Bonaparte, was a huge proponent of rose growing in the 1800s. She not only grew roses, she brought a bush of every known rose variety to the garden of her home, Chateau Malmaison. In doing so, she initiated a cultural obsession with roses that still exists in France today. Now in America, roses are everywhere. You can still grow roses for medicine or perfume, but most people grow them for their beauty. Regardless of your reasons for growing rose bushes, may you enjoy participating in a tradition nearly as old as history itself. Happy Growing!